This is about how most musical instrument manufacturers are doing the bare minimum to help prospects make a choice. This is a classic example of how a musical instrument company is singing the ‘it’s not as easy as it used to be, all the shops are closing’ song. If they keep doing what they used to do, they will struggle to maintain even their mediocre place in the market. I believe, the only musical instrument manufacturers who will not just survive, but GROW in 2017 and beyond are the ones who are playing a different game. Headline... Name of the season (summer) followed by the new product you've never heard of. Default text in the text preview with the words ‘mailing list’ and ‘unsubscribe’ TWICE! How’s that open rate working for you? They call this ‘tombstoning’ It where you put your name at the very top, as if the name of your company and logo are important to people. If you’re not sure… here’s how to find out by asking one simple question. Has anyone ever (preferable many more than one person) tattooed your company name on a body part? eg: Harley-Davidson, Apple, Nike, Coca-Cola, VW…. If they haven’t then you could probably be doing something more useful with this ‘prime’ bit of space in your email. You’ve never heard of this company we’ve partnered with, but here’s another logo for you. The scarcity tactic. Big letters, bold font. Does it induce panic and a rush to buy? Meh… maybe?! Here’s some body text about whats in our thing (as per the text)… Not what our thing will do for you / mean to you. Here are some stats about ‘worth’ to make you go ‘Ooooooo’… except for the fact, in this case, the value is completely unsubstantiated and only 2% of the cost of the product. The interest rate on your credit card is probably higher than this. 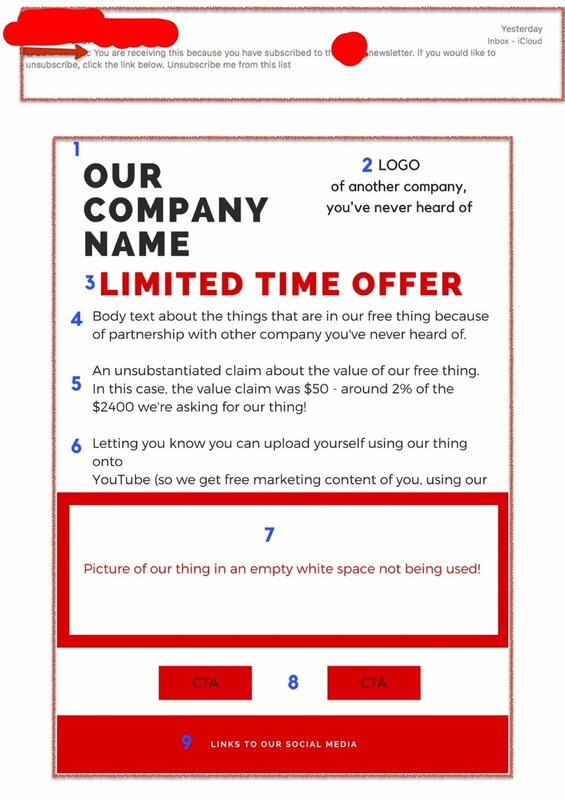 Finally here’s what you can do with the free thing that comes with my product… except, in this case, it’s a thinly veiled attempt to try and get you use the free thing to get you to upload you using my thing. (Still with me?). Terrible mistake. This could have saved it. The image of the product in a white space. Have an image of someone (your ideal customer) using your product and you instantly help people visualize themselves owning it. Calls to action… Discover more… buttons to take you to a website. Did you get this far? How likely are you to click? Meh! Fair enough… these need to be there, but you’ve even me no reason to go there? Did you invent something useful for musicians? Did you take it to market? Is it selling? Are you busking it or are you prepared to play a different game? If you’d like some help shipping your product to more people, you can hire me on a project basis to help you with your message to your market.